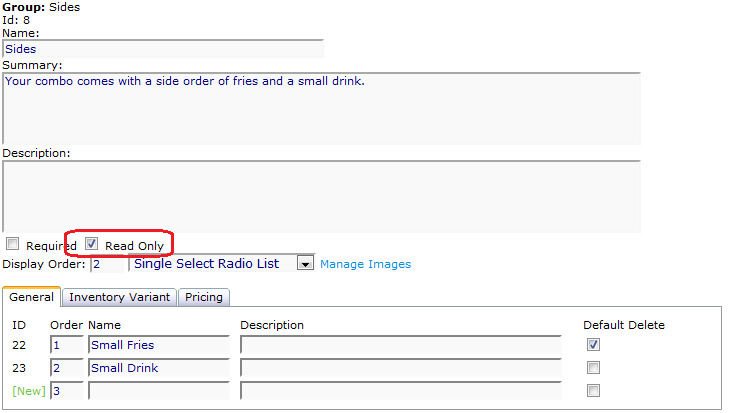 - If a customer adds multple identical kits to the cart they'll be listed as a single line item with a quantity >1. If multiple kits with different options are added, they'll be listed individually. - The 'Display Format XML Package' setting has no effect on kit products. 1 - First, create your basic product by clicking the green plus sign at the bottom of the Product Manager page. 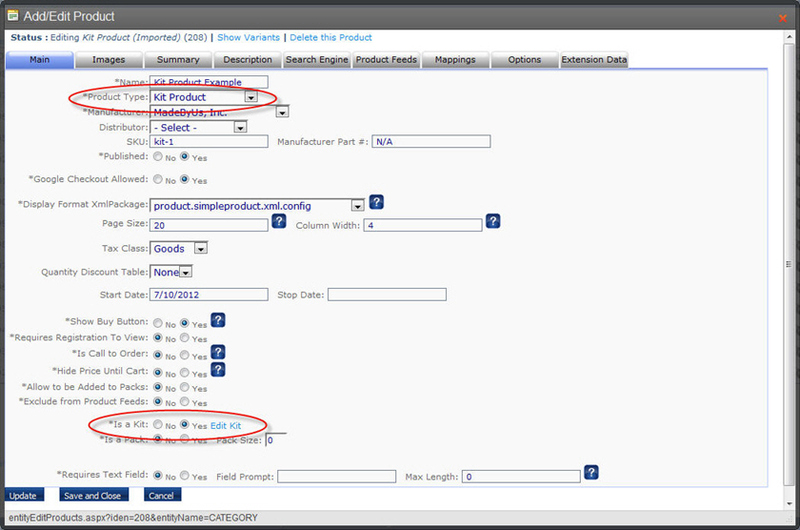 Make sure that the 'Product Type' dropdown is set to Kit and the 'Is a Kit' attribute is set to Yes. The price you set will be used as the base price, before customers choose any custom options. This price should include the cost of the default kit group options. See below for more information. The Name and Summary fields show when a customer first loads the product page. 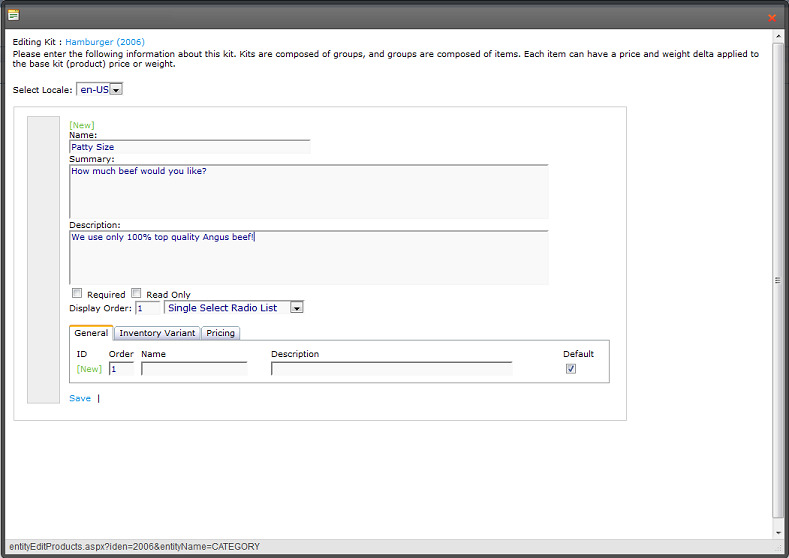 The Description field is used for additional information that customers can view by expanding a kit group (see below). You also need to select the type of kit group this is going to be, from the dropdown list. This determines how customers choose options (dropdown list, radio button, etc) and even how many options they can choose (multi-select checkbox types allow for multiple selections). Submit your changes with the Save link at the bottom of the window. General - On the General tab, you can enter the name and description of the kit items, as well as set the order they appear in and which item is selected by default. Inventory Variant - On this tab, you can click the Select link to be shown a list of all of the variants that currently exist in your store. You can choose one of those variants from the list and the name, price, and weight for that kit item will be taken from that variant. This also ties the kit item to that variant for inventory purposes so if a customer purchases a kit with that item chosen, the separate variant's inventory will be reduced (this is not valid for products using *Track Inventory by Size and Color:). Pricing - On this tab, you can set how much the kit price and weight will change if a kit item is chosen. Notice in the example above that the Small option actually reduces values, and the medium option has no changes. This is because the Medium size is chosen as the default on the General tab, so the price/weight for that option should be figured into the base price of the kit. 6 - The last kit group we're going to add contains items that cannot be changed (fries and a small drink in this example). These items will be displayed on the front end so customers are aware that they are included, but cannot be changed. Note that with this kind of kit group, all options must be variants selected on the Inventory Variant tab (see above). Their weights and prices will be added to the base price of the kit. To make this kind of kit group, just mark the group as "Read Only". 7 - Manage Images allows you to add images to each kit item, which are then accessible by clicking on the item on the kit product page. 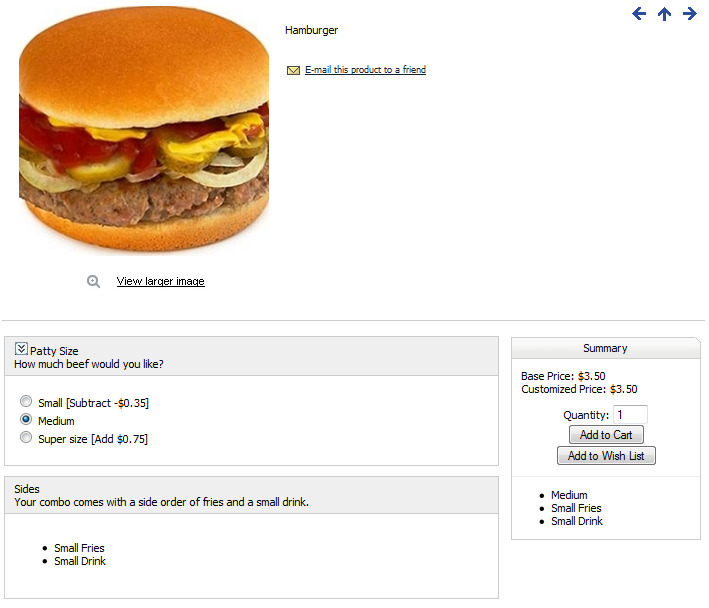 As customers choose the options they want, the price and description shown on the right will change. Once the kit is configured the way they want, customers click Add to Cart to purchase it.